Do any of you guys do crossfit? Or moreso just enjoy the kicks? spiderjericho and Beans like this. I use my metcons for weight training and some HIIT every now and then. I squat in lifting shoes, and I prefer to DL barefoot, but they just scolded me at my gym (at a university) and told me I have to wear shoes in the weight room, so I'm deadlifting in metcons too. I haven't ran in the metcons and I don't want to. I like them for their stable base, but they feel a bit clunky. I like running in dedicated runners. jking0821 and jm2000 like this. DonRafa and nightrunner like this. What I do would be similar to CrossFit. I compete as a Sprinter/jumper, so there are a lot of explosive movements and lifts in the 80-95% range. For what it's worth, I like the look of almost every new shoe that comes out. I'm always excited for updates in terms of performance, but I couldn't really care about aesthetics. I’ve been doing CrossFit since late 2012, I started in a pair of Nano 2s, then jumped on the Metcon train when they dropped. Really liked the 1s but I have bought several CWs of 2s, 3s, 4s. Also have a lot of Nanos, some NoBulls & a pair of the UA TriBase. Talked with James Newbury about them since he is a UA athlete, watched a few vids on them so I copped a pair. I like them for their minimalist fit but I find myself rotating through the Nanos, RF1s & UAs now & not so much of the Metcon for anything. DonRafa and jm2000 like this. Regular Metcon's aren't good for impact training, especially in the forefoot. Metcons for lifting and in a pinch, HIIT. very true. no matter how good a coach is they can’t save someone who is not willing to check their ego. Was squatting in my romaleo's and DL in my metcons (been squatting in my metcons recently since being tall some times the heel elevation causes me to pitch forward in my squat putting my back at risk). I would also wear metcons for chest day some times. But my issue was always running. I usually am on a tredmill every day i work out and if i wanted to run more then 2 miles id rather just wear running shoes to the gym. And being i was coming from work packing 2 pairs or shoes was unnecessary. I do not crossfit but am looking into those new UA tribase reigns or the metcon 5s. nightrunner and jking0821 like this. My personal issue with the Metcon Free is that they don't stayed securely laced when I am doing short runs/HIIT work outs. They are comfortable and great when I start off but the shoe laces keep coming untied after awhile so always in the back of my mind as my workout intensifies. I use regular Metcons as well for straight lifting and if strictly running like everyone else I use shoes strictly for that purpose. Wanted the Frees for my HIIT workouts but the lace issue is annoying. Hopefully the new Metcons solve this issue and I'll look into the UA TriBase as well. Also, wanted to use the Frees for some Spartan stadium sprint races for 2019 but again the lace issue probably will force me to go another route unless the new version fixes it. Just my personal experience with the Free but def comfortable and great otherwise for those type workouts. You think it's the laces? Hmmm, not sure as I've only used the laces that came with the shoes. Good idea, maybe a lace swap is the way to go. Will have to give it a try. Also try runner's loop lacing. Helps a lot. Appreciate it and will give it a shot as well. Grabbed these for $71 with that SAVE25 code that was going on a couple weeks ago, supposed to arrive today. First Free x Metcon's for me. 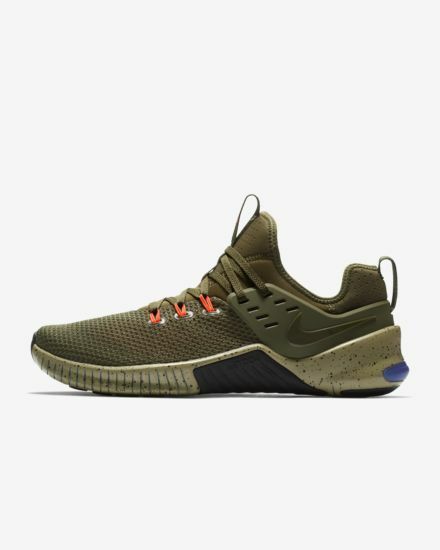 I debated which color forever, but thought this had really cool color mixing on em with the olive, orange and speckled sole. Did a ton of work in the Metcon 3, some in the 2 and just recently got the Creed Flyknit 3's, but might need to get them stretched, they're narrow AF. Was so excited for them too, especially after getting my pre-order cancelled then hitting the restock. Luckily my parents own a shoe repair shop so he can professionally stretch them perhaps. Don't want to return after all that . I really like them, they are narrow so if you have a wider foot I would not recommend them. I got the All red pair and they are great. doxen5703 and 6 Rings G.O.A.T. like this. I need this pair. Might paint that cage black too since it’s gonna get nasty eventually. I started to do CrossFit this year. It’s been humbling to say the least. My focus is to gain competence in the movements and worry about the weight later. I use my metcons for CrossFit with the exception of the running component. infraren and DonRafa like this.